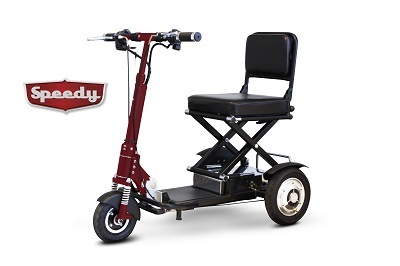 Equipped with electromagnetic brakes, oversized front and rear tires, a front basket and extra rear storage space the Speedy can be operated on a number of different surfaces. With a turning radius of 33 degrees and a total scooter weight of just 65 lbs, Speedy is a functional, fast scooter! THIS PRODUCT IS FAA APPROVED! Total Weight (Battery Included): 65lbs.